LONDON, England (CNN) -- One million free text messages will be sent every day for 12 months from Monday in South Africa in a bid to raise HIV awareness and encourage testing for the disease. 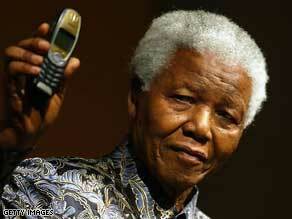 Former South African president Nelson Mandela launched a similar cell phone initiative in 2003. The ambitious Project Masiluleke is being rolled out across the country after a pilot period that saw calls to a AIDS national helpline shoot up by 200 percent, organizers say. This is a great example of intelligent use of emergent technology to address social/health issues. A free text message service is being utilized in South Africa to communicate about HIV/AIDS services available. Sure, we need to work harder to solve these problems, but this shows that we can also work smarter.